Potent production and reaping high-quality milk is the goal of nearly all the dairy farmers. High-quality milk constitutes of desirable texture, is unadulterated and that meets all quality standards for required Somatic Cell Count (SCC) proportion. The dairy farmers know the importance of maintaining a routine procedure of pre-milking udder hygiene and uniform attachment of well-functioning milking machines. The aim of milking management is to make sure that the teat cups are applied to clean and well-stimulated teats, milk is reaped quickly and efficaciously, and the milking units are removed once the milking is done. Various milking practices are conducted on dairy farms. There is no one particular milking routine that is applicable to all the dairy farms. 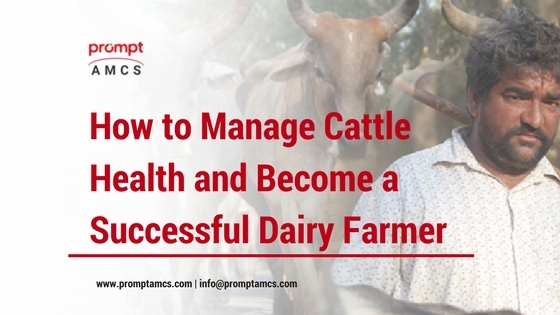 However, there are seven effective steps that can certainly suggest you a way to keep your herd happy and help you become a successful dairy farmer. Cow hygiene is a critical factor in determining milking efficiency and intramammary infections (IMI). Dirty cows extend the cow preparation time and shrink farm throughput. Teat cleanliness determines milk quality with cattle average somatic cell count. Environmental pathogens present in wet and muddy beds are often contagious and cause mastitis in the herd. Therefore, you need to set up proper bedding areas which are clean, dry and comfortable to reduce pathogen growth. Such management practices lower the development of mastitis. Furthermore, you can improve cow cleanliness by removing udder hair occasionally round the year. It is a good practice to group cows to minimize exposure of infected cows with the healthy (uninfected) cows. Generally, there are three classes of cows- infected, likely to be infected and uninfected. Individual somatic cell count (SCC) and cow culture determine which cows are infected and others fall under which categories. Cows having SCC >250,000 (score of >=4) are persistently infected. While cows with score <4 are uninfected. And cows having fluctuating scores are probably infected. In dairy farm operations, the order of milking follows that you must group and milk the uninfected cows first, then the cows which are likely to be infected followed by the infected cows in the end. Also, you should segregate the milking units among each class to minimize the transmission of infection. It is necessary to sanitize the milking units to reduce pathogen growth which can be achieved by rinsing the milking units thoroughly, exposing the machines to 25-30ppm iodine for minimum 30 seconds, rinsing with clean water followed by drying. Cows prefer a stable routine and it is desirable to rely on a standardized milking routine. It is often difficult to maintain such routine as there might be multiple operators employed on your farm who lack adequate training on milking with required efficiency. It is revealed that there’s an increase of 5.5% in milk yield when a standardized milking routine is followed. A stable pre-milking preparation is an equilibrium between speed and completion of the routine including steps like fore-stripping, pre-dipping and drying before attachment. Also, you must conduct an appropriate teat-end disinfection procedure on your cattle which can reduce the teat surface bacteria by 75%. Teat disinfection follows the procedure of drying the teats carefully. Wet teats expose a significant threat to the cows’ health as even a slight presence of moisture establishes a breeding ground for harmful skin bacteria. You can use either cloth or paper towels individually to dry the teats manually. Most often, cloth towels prove to be more absorbent than paper. Moreover, you can make effective use of latex or nitrile gloves to diminish pathogen contagion that can be caused by the skin. Timing is a vital factor in the attachment process. The time lapse between cow preparation process and unit attachment is called “prep-lag” time, and to maximize the milking efficiency, you must attach the units soon after (preferably within 1 minute) stimulation begins. Prep-lag time >3 minutes results in more residues which are of less use. It is shown that optimized prep-lag time generates greater milk flow within a few seconds of unit attachment. Likewise, you should also decide the number of cows each operator will prep at your farm afore unit attachment. The process of milking is declared complete when the milk is fully obtained. There are two incidences that can occur while milking. One is under-milking that occurs when you have not removed all the milk from the udder. This ultimately results in financial loss. The other situation is over-milking that arises when you let the teat cups remain attached to the teats albeit the milk isn’t flowing. This causes damage to the teats revealing a risk of mastitis. Traditional operators observe when milking is done and declare the same later. While just a few operators rely on Automatic Take-off Units (ATO). A study suggested that these operators who used ATOs were more efficient than the operators using conventional mechanisms. You can achieve additional improvement in the milking time and state of teat ends by adjusting the ATO settings. Post-milking cleaning and hygiene of cows are imperative. The practice was developed to lower mastitis contagion by using either teat dipping or spraying. Spraying gains preference by many operators as the practice is convenient and keep the teat dip uncontaminated from the milk. While spraying proves inadequate occasionally, a properly dipped teat is likely to be less prone to pathogen transmission. You can include any of these methods depending on your requirement and feasibility. During the subzero temperatures, it is advisable to halt the use of teat dipping practice and instead allow contact time of 30 seconds followed by drying. The last phase of an efficient milking routine involves encouraging cows to remain standing for at least 30 minutes post-milking. Effective herd health management is crucial for any farm as much as high yield. The principles as mentioned above are sure enough to lead you to the success of your dairy farms. But it is equally important to nurture your herd with personalized attention and care for their longer well-being and stable farm returns. A tip to save your day- Use modern apps like Farmer App to adeptly track your herd’s milk production and manage the overall dairy business. Happy milking!